There’s little doubt that, given the choice to camp beside a nice river or a ‘dry’ camp, fewer would opt for the latter. There is something soothing about the sound of gently flowing water that offers a feeling of tranquillity that can be seldom matched. But as our recreational demands increase, it gets more and more difficult to find that little bit of Nirvana. It still exists, though in random pockets in out of the way places. 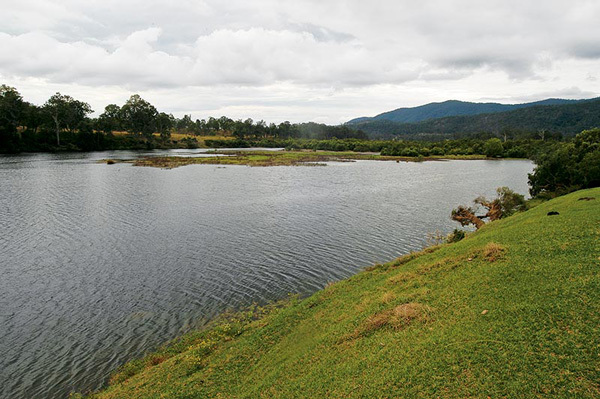 The mighty Clarence River has, for many years, been pivotal in the minds of fishers, canoeists and adventurers of all kinds. Its tributaries are no less well thought of; the Nymboida and the Mann rivers conjure up images of wild rapids and great volumes of water, all framed by a landscape that varies wildly at every turn of the stream. Our trip begins downstream from the little riverside village of Tabulam, where the mighty river rolls below a bridge steeped in the history of the land. Plains Station Road exits the Bruxner Highway on the western side of the river, and heads south to the first stopping place, the oddly-named Alice. The road crosses the Clarence here on a low bridge that seems to barely skim the surface of the river, and, once on the Eastern side, you may turn off and follow the winding track through the groves of gnarled melaleucas, all of them bent to the will of periodic flooding. Carnham Crossing is another travelling stock reserve and you have to follow the Clarence Way until about 20km south of the Aboriginal mission of Baryulgil. Then it’s another short drive of about 18km to where the road crosses the river once again. This is another low level bridge, and you may notice variations in the bridgework. A couple of sections were washed away in one of the floods that underlie the power of the river when it gets ‘cranky’, as some of the locals say. 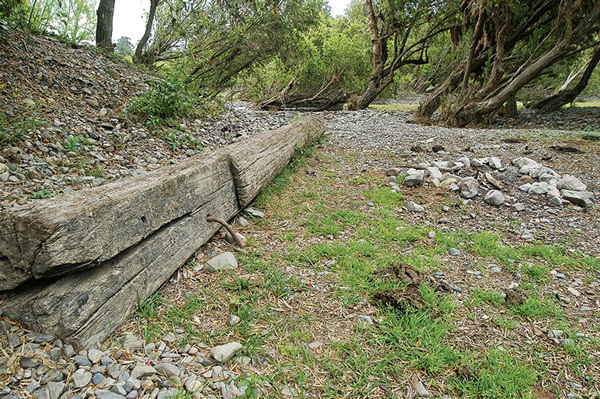 Remains from the washed-up section can be found in the scrub below the crossing. The track into Carnham requires a little care, with a few washed away sections. 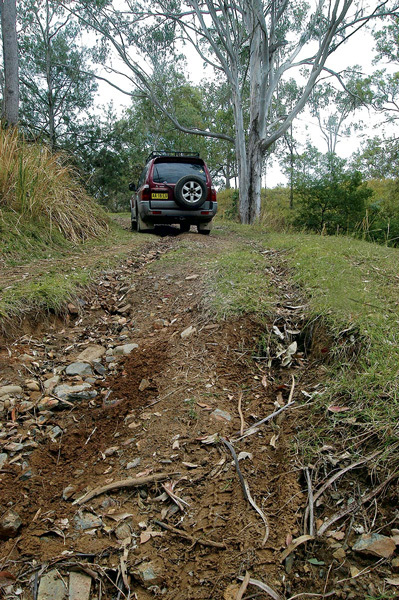 It’s not ideal for conventional vehicles; at the time of our visit, 4WD was definitely needed. The track winds through the ever-present melaleucas and sheoaks and along the way you just pick out a spot and set up. Like most of the Clarence, the banks of the river are sandy and swimming and canoeing are the ideal pursuits. Once again, fishing is possible but for the most part, you’ll probably have to settle for eel tailed catfish. However, from here, and with a reasonable mount of effort, you can get down to where the Mann River joins the Clarence. There you will have a better chance of catching Australian bass. Eastern cod are also present but they’re protected. Back on the track or, as it’s known, Carnham Road and you follow the gravel through some of the most picturesque country imaginable. This is all private land and often signs are there to discourage visitors. You will come to a well-defined intersection that takes you back toward the river. 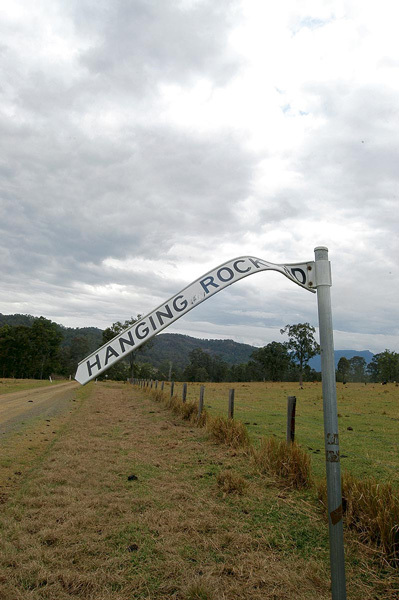 This is now Hanging Rock Road, and you are now headed for the Broadwater. Here, you cross the Mann River, once more over low level bridges, two of them, to make your way to the expansive area of the Broadwater. This section of the Mann is as its name suggests, broad, and the banks along the shore are mainly rounded river rock. This can make travel a bit bouncy and while some parts would be accessible by a carefully-driven conventional vehicle, a 4WD is a definite asset. People bring large caravans in here so it’s nothing too extreme as far as driving is concerned. At the Broadwater you have access to some of the best water along this trip. 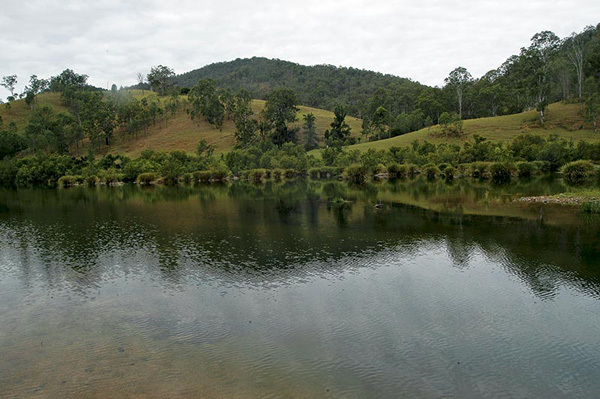 Fishing for Australian bass is usually best in the early morning and late afternoon, right up to dark. This river is completely closed to all forms of fishing though during the breeding period of the eastern cod during the months of August to October. Penalties apply if you are caught, and the Fisheries do run patrols through here. From Broadwater you have an easy run up to the Cangai section of the Mann. 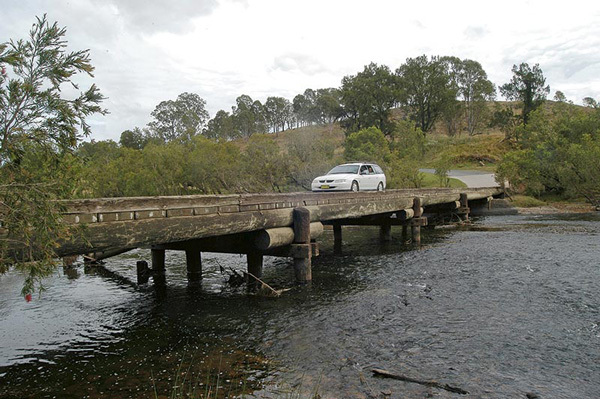 There’s another low level bridge here, but unless you want to head across to the Gwydir Highway you don’t need to take it. 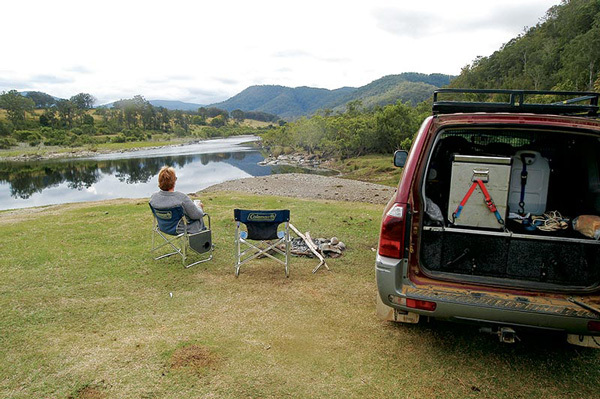 Camping on the western side of the river is not as good nor is it as accessible as the Eastern side. There is no lack of good level areas on the eastern side and if you get there at the right time you may secure yourself a good spot with uninterrupted views down the river. Once again, this is a great spot for camping, fishing, swimming and canoeing with the usual provisions for closed fishing seasons. 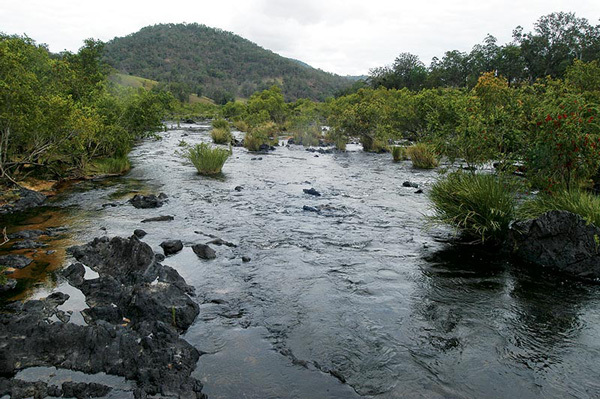 Tabulam is 130km west of Byron Bay and Cangai is 60km north-west of Grafton, NSW. 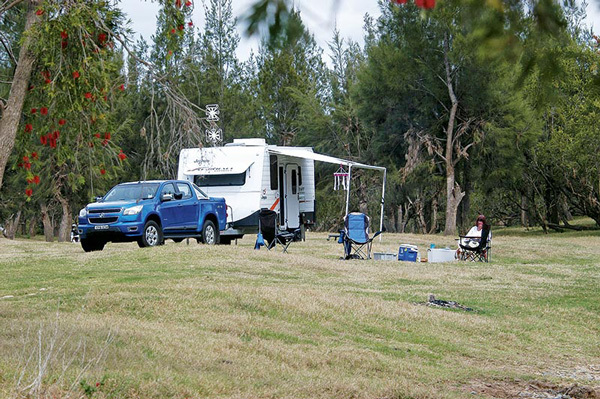 Most campsites are a good size and, as the gravel roads are in reasonable condition, the area is ideal for towing a camper trailer. The free campsites have no facilities for self-sufficient travellers but plans to regulate camping and provide basic facilities are afoot. 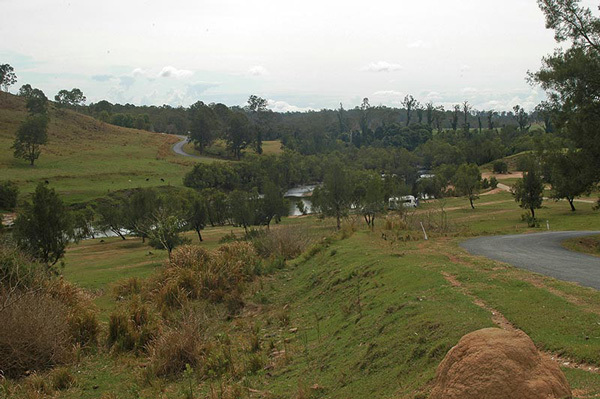 Lilydale, Cangai, Broadwater and Alice are included, with another area over on the Nymboida at Buckarumbi but it looks as though camping on the Travelling Stock Reserve at Carnham is unaffected. Firewood is rare except for when after a flood so bring in your own. Adhere to all fire bans and where viable use an existing burn patch. Flood debris in the upper canopy reveals the force of a ‘cranky’ river so postpone your trip in flood, and leave if river levels dramatically rise, especially if there’s rain further up in the catchment. Avoid crossing the concrete floodways or low level bridges if there’s water flowing over the top. Check out the full feature in issue #94 November 2015 of Camper Trailer Australia magazine.